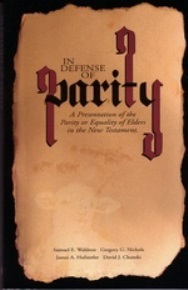 Poh Boon Sing argues that holding to parity of authority among the elders produces the effect of “undermining the Christian ministry.” However, it is the view that ratchets the authority of some elders up by a notch over other elders that tends to devalue the office of elder and thus to undermine the authority of the church’s leadership. This occurs in at least two ways. Their authority, also in the whole rule of the church, is every way the same with that of the other sort of elders; and they are to act in the execution of it with equal respect and regard from the church. And this institution is abused when either unmeet persons are called to this office, or those that are called do not attend unto their duty with diligence, or do act only in it by the guidance of the teaching officers, without a sense of their own authority, or due respect from the church. Second, the unscriptural view of the inherent superiority of one class of elders and the inherent inferiority of another leads to another pitfall, the watering down of qualifications for the office of elder. Even if it is maintained with Owen that both “pastors” and “ruling elders” hold the same office and that the scriptural qualifications are therefore identical, the departure from Owen regarding relative authority will inevitably lead to a two-tiered approach to the qualifications for office. To dilute the qualifications for one class of elders in the church is to dilute the qualifications for the eldership as a whole. Such dilution of standards jeopardizes the credibility of the church’s government in the eyes of the church and world and, more seriously, puts souls at risk, particularly those of unqualified men who are placed in office (1 Tim. 3:7). On the other hand, we know of no scriptural means more calculated to uphold the integrity of the Christian ministry and to secure the esteem of the people for church leaders than the maintenance of scriptural standards for the office of elder. We cannot pretend that upholding scriptural standards for elders will safeguard the church from sin and incompetence in the eldership—even apostolic churches had their Diotrephes. However, care at this point is a primary means of keeping men of Diotrephes’ persuasion and tendency out of the Christian ministry. Further, taking such care to insure that all the elders in a church meet the Bible’s qualifications for office gives greater grounds for confidence that the men comprising the eldership will be able to effectively work together in a calling that requires the flesh­-withering labor of mutual submission, mutual trust, and real cooperation. The principle of ‘plurality’ is being bandied about as a new form of ‘shibboleth’. In the face of these new problems, it would not be wise to stress ‘plurality’. No, it might not even be right to do so. It is requisite that utmost endeavours should be used, in order unto a full supply of officers in the churches, according to Christ’s institution. The defect of these churches, on this account, is very lamentable, there being in most of the churches only one teaching officer for the burden of the whole congregation to lye upon. The Lord Christ would not have instituted pastors, teachers, ruling-elders (nor the apostles have ordained elders in every church-Acts 14.23; Titus 1.5,) if he had not seen there was need of them for the good of his people; and therefore for men to think they can do well enough without them, is both to break the second commandment, and to reflect upon the wisdom of Christ, as if he did appoint unnecessary officers in his church. Owen himself argued in no uncertain terms that the Bible’s norm of a plurality should be the desire of every church for practical as well as theological reasons. He wrote, “It is difficult, if not impossible, on a supposition of one elder only in a church, to preserve the rule of the church from being prelatical or popular.” In other words, to neglect the scriptural norm of plurality is to implicitly invite either the perils of the prelatical system of Owen’s day or the absence of any genuine church government, such as exists in the congregationalism of our own day. Owen further argued that “The nature of the work whereunto they are called requires that, in every church consisting of any considerable number of members, there should be more elders than one.” His point is that the preservation of the life of godliness in both pastor and people, their maximum edification, and the good order of the church of Christ are all best served by a plurality of elders, not by single elder rule. He wrote, “That all these things can be attended unto and discharged in a due manner in any church, by one elder, is for them only to suppose who know nothing of them.” For good and weighty reasons, Owen held strong convictions regarding the importance of plurality. We do well to emulate him in this. The fact that one or two churches have functioned well with this system is no proof that it is correct. It only proves that the men involved have been long-standing friends who would have operated well in any other situation. We agree that a harmoniously functioning eldership in which there is parity of authority does not prove that the system is biblical. That determination must be made exegetically. But a well-functioning eldership with parity does prove that the Bible’s order of church government is practicable. It is not only practicable, it is ideal, and its realization ought to be our aim. To suggest that such an eldership owes its harmony to quirks of personality is akin to attributing every God­-honoring Christian marriage to mere compatibility of the partners and asserting that they would have been successful even if they had remained unregenerate. The reality and profundity of the Holy Spirit’s ministry is denied. The Bible’s form of church government requires faith in the necessity and efficacy of the work of the Holy Spirit. If we walk by sight and not by faith in this area, we will inevitably settle for a pragmatic arrangement, having concluded that the Bible’s method is designed for implementation only by angels or spirits of just men made perfect. Functioning in harmony with parity requires more than simply having godly men in the eldership. It requires the present and powerful dynamic of the Holy Spirit. He alone can help men of diverse age, gift, native inclination, and experience to cooperate peaceably and successfully. Only the Spirit of God can enable men to soberly assess themselves (Rom. 12:3ff.). Only He can enable them to mortify pride. Only He can keep them from sinful contentions and enable them to submit to one another. Only He can enable a man to sincerely appreciate and welcome the genuine oversight of his own soul by men who may be his inferiors in age, learning, or gift. By the same token, it is only the Holy Spirit who can enable equals in authority to defer to those who possess greater gift, experience, insight, or familiarity in a given area or situation. Dr. Poh sees it as an inherent weakness of parity that it gives rise to a “constant tension of having to give deference to one another.” However, pride will wreak havoc in any eldership, whether it has parity or not. No system of church government produced Diotrephes. Diotrephes spoiled the government of the church (3 John 9). The requirement of humility and the perpetual demand for submission is not peculiar to systems of church government holding to parity. It is required for the Christian ministry, period. If a man cannot defer to his fellow elders, how can he faithfully and effectively shepherd the flock of God (1 Pet. 5:2f.)? If he cannot defer to his fellow elders, how can he be the servant of Christ’s people (Matt. 20:25-27)? If he cannot defer to his fellow elders, how can he truly esteem others better than himself (Phil. 2:3-5)? If he cannot defer to his fellow elders, how will he ever spend and be spent for men’s souls (2 Cor. 12:14f.)? If he cannot defer to his fellow elders, let that be the first clue that he is not fit to be an elder in the church of Christ. This entry was posted in 1689, Parity of Elders, Reformed Baptist and tagged Biblical Concept of parity, Parity of Elders, Reformed Baptist.